Danc talks about himself as a game designer, pixel artist, painter, tools designer, product manager and marketing guy from Seattle, Washington. He has been creating game prototyping graphics for years now, allowing independent game creators to focus on their mechanics and not get tangled up in the graphics part of the game creation process. 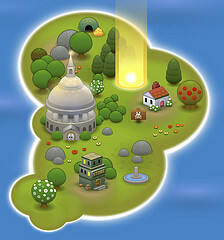 Danc has just released his latest set of graphics entitled “Small World”. Emerging out of Danc’s fascination of tiny ecosystems – worlds you could keep within your reach and sculpt like a bonsai tree – the package contains images of the blue water, the land, trees & little houses. * Crazy innovative games that will shock and amaze the world. One of Danc’s most successful past graphics sets was “Danc’s Miraculously Flexible Game Prototyping Tiles”. The graphics were used in many mini-MMO’s, shooters, RPGs & other indie projects since and the zipped set of icons is still available for a free download. If you are looking for some more prototyping graphics or maybe even textures, make sure to browse through Danc’s website well – there is many treasures hiding around everywhere. All graphics available for download from the LostGarden.com website are licensed under Creative Commons Attribution 3.0 License, which means everybody can download them, share, modify, even use in commercial products for as long as the proper credit is provided to Danc. You can read more about licensing Danc’s graphics here. And just as a last note – all graphics are free, but if you end up making profit on a project you included the images in – be nice, share the wealth & donate some cash to the hard working designer.